Spondylolisthesis is when one vertebra slips forward over the vertebra below it. Most often, that happens in the low back (lumbar spine) because that part of your spine bears a lot of weight and absorbs a lot of directional pressures. In other words, your lumbar spine has to move quite a bit (rotate in various directions) while carrying your body weight. Sometimes, this combination can put so much stress on the vertebrae that one of them slips forward. The x-ray below gives you a good example of spondylolisthesis. Look at the area the arrow is pointing to: you can see that the vertebra above the arrow isn't in line with the vertebra below it. It's slipped forward; it's spondylolisthesis. Many people with a spondylolisthesis are symptom free. Sometimes, a spondylolisthesis is discovered when the patient has an x-ray for an unrelated problem. However, some patients do have symptoms that range from mild to severe. Spondylolisthesis has several main causes. Type I: This is also called dysplastic or congenital spondylolisthesis. Congenital means that you're born with it. Type I spondylolisthesis, then, is a defect in the articular processes of the vertebra (the part that's supposed to control the movement of the vertebra; your facet joints are made of the articular processes). It usually happens in the area where the lumbar spine and the sacrum come together: the L5-S1 area. The defect allows the L5 vertebra (your last vertebra in your lumbar spine) to slip forward over the sacrum. •Type II A: Gymnasts, weight lifters, and football linemen are especially prone to this kind of spondylolisthesis. It's caused by multiple micro-fractures on the pars interarticularis—micro-fractures that occur because of hyperextension (overarching) and overuse. The pars fractures completely in type II A. •Type II B: This type is also caused by micro-fractures. The difference, though, is that the pars don't fracture completely. Instead, new bones grow as the pars heals, causing it to stretch. A longer pars can then cause the vertebra to slide forward. •Type II C: Like type II A, this type has a complete fracture. However, it's caused by trauma. The impact in a car accident could fracture your pars, for example. A pars fracture can lead to a mobile piece of bone; the detached inferior articular process can actually move around. This bone fragment, also called a Gill fragment, can pinch the exiting nerve root, so the bone may need to be removed. Problems with the pars interarticularis can also be called spondylolysis. The word looks like spondylolisthesis, and they are somewhat related. Micro-fractures in the pars interarticularis—the kind that gymnasts, football linemen, and weightlifters are prone to—are a form of spondylolysis. The fractures are called spondylolysis; if the vertebra slips forward because it's not being held in place properly, it's called spondylolisthesis. 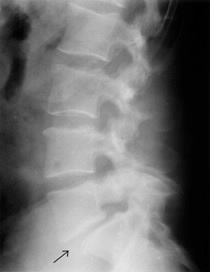 Type III: Aging can also cause spondylolisthesis. As you grow older, the parts of your spine can degenerate; they can wear out. Usually your intervertebral discs change first. The older you get, the less water and proteoglycan content the discs have—and less fluid makes them less able to handle movement and shock. Less fluid can also cause the disc to thin, and a thinner disc brings the facet joints closer together. Without the disc acting as the cushion, the facets can't control the spine's movement as well, and they become hyper mobile. Eventually, a vertebra can slip forward because the facets aren't holding it in place effectively as the spine moves. Type III spondylolisthesis usually happens at the L4-L5 region (the fourth and fifth vertebrae in your low back), and it's more common in women over 50. Type IV: Similar to type II C, type IV involves a fracture. However, it's a fracture of any other part of the vertebra other than the pars interarticularis. Your facet joints, for example, can fracture, separating the front part of your vertebra from the back part. Type V: Tumors on the vertebra can also cause spondylolisthesis because they weaken the bones and can cause fractures that split your vertebra, leading to instability and a potential slip. Type VI: You have this type of spondylolisthesis if surgery caused your vertebra to slip forward. It's also known as iatrogenic spondylolisthesis, and it's caused by a weakening of the pars, often as a result of a laminectomy (a typical back surgery, but type VI spondylolisthesis isn't a typical result of the surgery). Using the lateral (side) x-ray, your doctor will grade your spondylolisthesis. He or she will use a grade I through grade V scale that describes how far forward your vertebra has slipped. •Grade I is a less than 25% slip. •Grade II is a 25-49% slip. •Grade III is a 50-74% slip. •Grade IV is a 75-99% slip.